Three-quarters fill a medium saucepan with water and bring to the boil. Once boiling, carefully add the eggs to the pan and boil for exactly six minutes. Use a timer as the eggs want to be just perfect with a lovely runny yolk. Once cooked, transfer to a bowl of iced-cold water and carefully peel. Be aware that the eggs are still runny and that you need to handle with care. Add the remaining ingredients, including 100ml/3½fl oz water to another saucepan, gently bring to a simmer and cook until the sugar is dissolved. Remove from the heat and leave to cool. 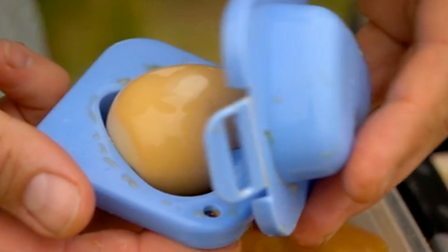 Place the eggs in a small container that will fit neatly as you want the liquid to nearly cover the eggs. Pour in the cold marinade and place a small piece of muslin or a jay cloth over the eggs – this helps to make sure the eggs get an even coating of the marinade as the liquid will soak in to the material as well as weighing the eggs down in the liquid. Marinate for at least 12 hours, but ideally 24.